The Upside is a 2017 American comedy-drama film directed by Neil Burger and written by Jon Hartmere. It is a remake of the French 2011 film The Intouchables, which was itself inspired by the life of Philippe Pozzo di Borgo. 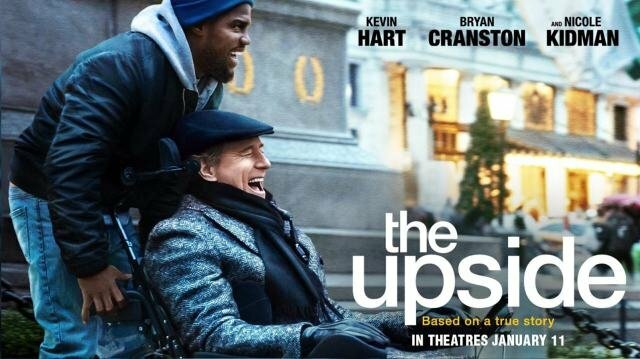 The film follows a paralyzed billionaire (Bryan Cranston) who strikes up an unlikely friendship with a recently paroled convict (Kevin Hart) whom he hires to take care of him. Nicole Kidman, Golshifteh Farahani, and Julianna Margulies also star. It is the third remake of The Intouchables after the Indian film Oopiri and the Argentinian film Inseparables (both 2016). An English-language remake was first announced in July 2011. Numerous actors were rumored to star, including Chris Rock, Idris Elba, Colin Firth and Jessica Chastain, and different directors, including Paul Feig and Simon Curtis, were attached to direct. Hart officially signed on in October 2014, Cranston in March 2016, and Burger to direct that August. Filming began in Philadelphia in January 2017.